Dover Farms in Concord. Photo by Alison Leininger. A mile and a half from the Charlotte Motor Speedway, just beyond a BP station, drivers speed past a field of typical North Carolina produce — beets, greens, radishes, strawberries — and by a plain wooden shed behind signs boasting "Fresh Produce! 300 Feet." Beyond that, an unexpected landscape: wooden posts connected by taut wires draped with graceful leaves and tiny green orbs of grapes, worthy of a Napa Valley postcard. These are not the scuppernongs or muscadines grown by generations of North Carolinians. They are Chambourcin red and Villard blanc, two carefully chosen varietals for wine production. The vineyards offer six kinds of wines, including a pair of Villard Blancs aged separately in stainless steel and in barrels. "They are two very different wines. It's a very versatile grape," Dover Vineyards owner Elizabeth Anne Dover says. The four acres make up the birthplace of Dover's wine business. Along with six acres of produce and a shed in between, they also make up the easily missed seat of power of the 32-year-old's mini local-food empire. On both sides of her family, the Concord native carries a lineage of food. Her roots in Concord go back to the 1750s, and most of them were planted by farmers. Her father Audy owned a grocery store, as many did before him, and Elizabeth Anne grew up with grandparents, cousins and third cousins who made their living by tilling Carolina clay. In hindsight, it's not surprising Dover has made a career of both growing and selling food. What's surprising is the crop she chose to specialize in: wine grapes. It was both emotional and strategic. "I saw this PBS special on vineyards, and that they were the new and coming thing," she says. "It was going to be a challenge, and it sounded like my sort of lifestyle, being outdoors, working hard." Dover flirted with a vastly different career, majoring at Davidson College in medieval Spanish, with an eye to entering the diplomatic corps. But by the time she graduated in 2007, she realized she wanted to stay in her hometown; that her ideal lifestyle was more tied to the outdoors than to government office buildings. Dover thrives on challenges and hard work, but she also saw wine as a way to avoid some of the pitfalls of traditional farming. "You have to have something that's not perishable and has a good margin on it to sell the produce. Because the produce is so risky," she says. So in typical charge-ahead fashion, Dover enrolled in an N.C. State University horticulture program, where she studied with Sara Spayd, "the godfather of North Carolina wine," and spent the winters working on vineyards in New Zealand and Australia. Dover's shop is open for business. 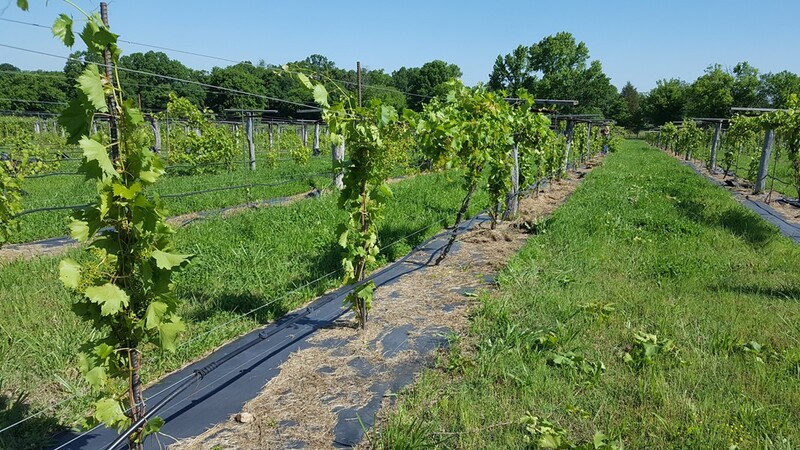 In the meantime, she started planting her own vineyard and produce farm on her grandmother's land in 2009, with the help of her parents, who remain an essential part of the business. The petite farmer is seated comfortably on the small porch of her produce shed, chatting about the many branches of her business and watching the traffic swish by, occasionally exchanging waves with family friends. Dover's team arrives suddenly and unloads 120 pounds of fresh-picked strawberries for an order from NoDa Brewing. She gathers with them briefly to lay out the next set of projects and then the employees are gone, eager to get to work. "Having multiple employees who can all do the job is essential," she says. "For the first few years I was killing myself, because I was doing the manual labor and everything else." Everything else covers a lot of ground. 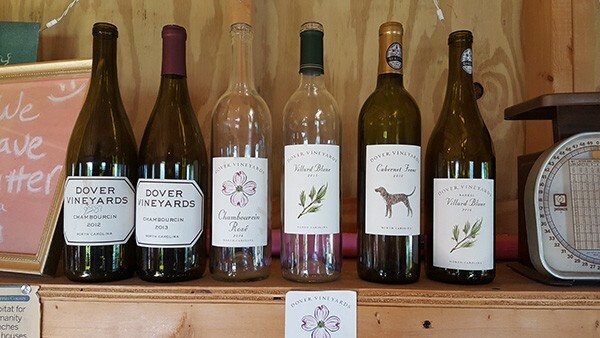 Dover's degree landed her an assistant winemaker position that she still holds at RayLen Vineyards outside Winston-Salem, where all Dover Vineyard wines are fermented. In 2012, as her first wine-ready grapes were ripening, she staged a one-woman revival of the Plaza Midwood farmers' market. She recently picked up a fill-in bartender position at High Branch Brewing, and is constantly working parties and events to sample out and promote her wines. All of this while regularly manning her roadside farmstand five days a week. Dover's plain wooden shed houses more than the fruits of her many labors. It also symbolizes another aspect of her business savvy, that of building symbiotic relationships with other local businesses. It holds products from half a dozen area farms: nut butters from Mooresville, honey from Montgomery County, pork from Cleveland, chicken from Gold Hill. 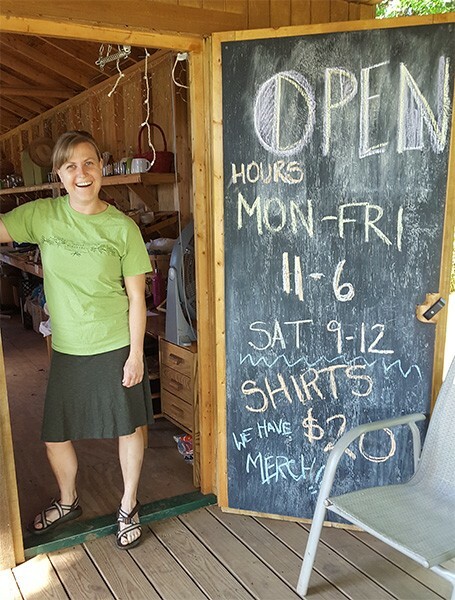 Besides offering a local outlet for those farms, Dover brings their goods along to her Saturday market in Charlotte, and invites a few to piggyback their products on her own weekday delivery routes. So Chase Reynolds of Two Pigs Farm in Cleveland can get his eggs to Courtney Buckley of Your Mom's Donuts in Matthews, which "gives him three hours of his day back, and it gives her the farm-fresh eggs." All of this seems self-evident to Dover, a woman immersed in her rural community. Blake Barnes, owner of Common Market where Dover sets up on Saturday mornings, shares her collaborative outlook. "I felt like she had a good sense of community," Barnes says of his first impressions of Dover. "I like how calm she is, [that] she has quality stuff, and that she'll pull in other people, too" — like producers of honey and muffins. "I love having them there." Back home in Concord, Dover also donates land and time to her church, First Presbyterian, where volunteers grow several rows of food for donation. She was inspired to begin on her own after seeing a TV show about child hunger in the United States. "This happens a lot," she says, then starts laughing. "I think the little baby Jesus speaks to me through CBS Sunday Morning." When imagining the future of her empire, she refers to a more recent episode, about Ballymaloe House in Ireland. There, another determined woman, Myrtle Allen, opened a bed-and-breakfast that expanded into a farm and cooking school and ended up revolutionizing Irish cuisine. "If I could do something similar to that with my life, I'd be very happy," Dover says. "We have so much food, and it is so delicious, there is no reason why anyone in this area should not be eating delicious food." Keep your eyes open. Because if Elizabeth Anne Dover has anything to say about it, we're about to become the best-fed region on the map.